A short walk for a summer evening, the main highlights being the ruined Hellfire Club and the spectacular views across Dublin city. The walk is circular and can be done in either direction, but its recommended to go clockwise (starting out along the forestry road, returning directly downhill) to best enjoy the views on the return leg. The route is straightforward and follows well trodden paths. Starting at the car park, walk the length of the car park to where a forestry road starts. Follow this road for about 1km as it twists through the woods, then take the sharp right turn onto another forestry road that appears as the main road bends to the left and heads downhill. Although there a few muddy paths leading off from the main road, the right turn you want is the first one onto a proper forestry road and so is easy enough to spot. Follow the road for about 300m to find the Hellfire Club. This is a ruined building with a colourful history – see, for example wikipedia for more details. There are great views over Dublin city from here. 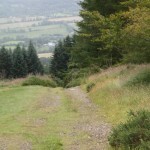 Continue past the Hellfire Club following a narrow path downhill through the trees. This leads directly back to the car park. Last time I did this walk there were kids buzzing about on trail bikes, which fairly ruined the atmosphere of the place. Not sure whether this is common or not – hopefully not. Are there any groups walks out there? We have a very enthusiastic 7 year old son and would love some company for him. And probably some others that I don’t know about. I haven’t been on any of their outings myself, so can’t comment on how child friendly they are I’m afraid. The description says, ‘walk the length of the car park to where a forestry road starts’. Which car park? Is this in Marlay Park? If so I think there are more than on car park. Frank, the Hellfire Club is further up in the hills than Marlay – near to Massey Woods if that’s any help. I’d suggest taking a closer look at the map on this page as that shows precisely where the walk starts, and also the road numbers etc to take to get here. Its possible to zoom out from the map to get a wider view by clicking the + button the map – that might help put the location of the walk in the right context. Its a pity the hellfire car park is closed most of the time, you can park at Massey woods just opposite. There are a few club and orginisations using this as a starting point: http://www.theramblers.ie have a few grades so do http://www.theamblers.ie great for kids though. A walk down to Carthy’s Castle is always worth it too. Check out mountaineering Ireland for info on clubs/walking groups! Doing a circuit of Massey’s Wood – there are two trails marked out around the wood the entrance to which is slightly downhill from the Hellfire car park. From Massey’s Wood there is also a marked trail on to the Dublin Mountain Way. Following this will take you up a steep climb beside a river to Cruagh, where another circuit awaits you if you are really adventurous. Be warned: Both are extremely wet and muddy in the Autumn – Spring months. does anyone know of walks that are easily accessible by public transport (dart/dublin bus/bus eiranne)? Did this walk last week, stunning views over Dublin, however very dissappointed in the graffitti on the Hellfire Club. TAKE CARE!!! Our car was broken into whilst parked in the carpark while we were out on the walk, both front locks popped and our camping generator was stolen from the boot through the car! Really spoilt our day and our holiday. We were aware of the signs and people saying don’t leave valubles in your car, however this generator has been in our vehicle for the length of the summer & left in more remote places here in the mainland. 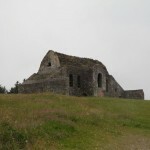 I went for a walk up to the Hellfire Club to-day with a group. When we got back to the hellfire car park five of our cars had been broken into. I had left nothing valuable in my car so there was nothing for them to steal but I have the nuisance of getting the window repaired. This seems to be a regular occurrence in that car park.